About one month before our lives were turned inside out and we packed up and moved to San Diego we had the pleasure of my little sister flying in from Florida to visit us. She has quite the influence on Steve and I when she comes to town. We did nothing but eat, eat and eat and not just the homemade kind of eating. Everyday there were slurpees, lattes, In-N-Out, Port of Subs and lots of other terrible but delicious food to be had. She and I made loads of cupcakes, I taught her how to make homemade pasta and she made us quiche. All in all it was a pretty glutenous week for the three of us. I’m new to the world of quiche and boy have I been missing out! 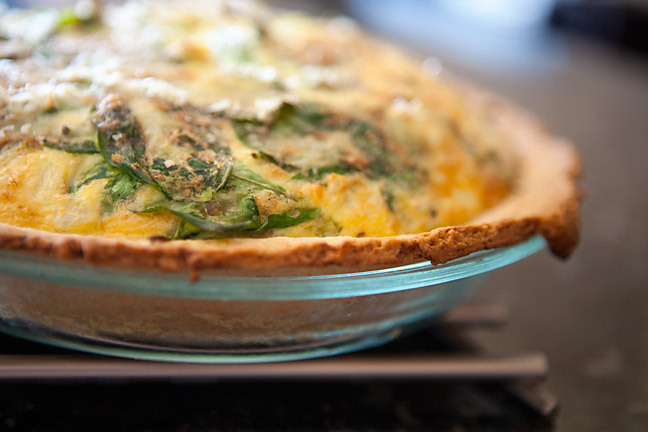 There is a fantastic cafe in Las Vegas that is owned by a French family and they make the most incredible quiche. 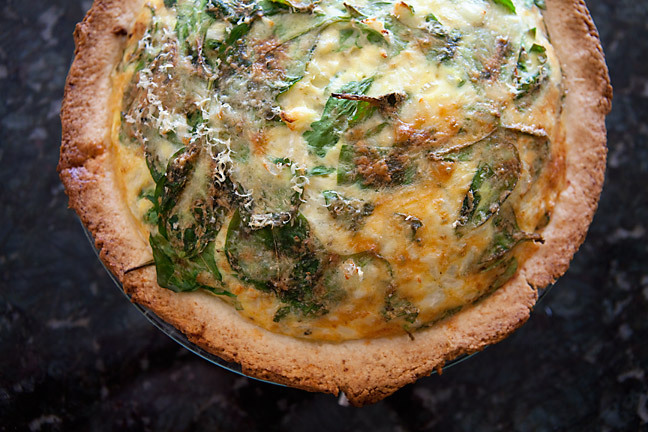 The crust is flaky and buttery and the quiche is delicate, flavorful and has just the perfect amount of richness. I would have never tried to make this on my own because it’s such a treat to have at the cafe but in strolled my 22 year old sister with a recipe that she put together after an episode of Throwdown and I am a changed woman. She made it look easy and I can’t lie but it was very satisfying watching her slave over the stove on a Sunday morning while I sat on the couch enjoying my Starbucks. 2 1/2 cups cheese pick 2 or 3 of your faves – we used goat cheese, cheddar and mozzarella. 1. Heat the oven to 400º. Mix dry ingredients in a bowl and then cut in the butter until you have a cornmeal consistency. Add the cold water and mix until you have a dough. Roll is out and place into a pie pan. 2. Whisk the eggs, add the milk, onion, cheese, spinach, salt and pepper. Pour over crust and bake for 30 minutes or until crust is golden brown. Wow! That sounds great. I just turned on my printer so I can make a hard copy of that one.